When one thinks of meatballs, usually some sort of marinara accompanies it. However, if the meatballs are made of lamb and have seasonings that lean toward a Greek-inspired dish, then you need a sauce to match. For me, that is cool and creamy tzatziki. Made with Greek yogurt, cucumber, and garlic, it is incredibly simple to make. I know, many of you may be thinking, but it’s even easier to buy. I will admit that I have bought tzatziki when in a rush, and there are some decent store-bought tzatzikis to be had. However, my recipe has only six ingredients (four, if you don’t count salt and pepper as ingredients). It takes about 5 minutes to make and then just hangs out in your refrigerator until you’re ready to use it. Besides being simple and quick to make, why should you try this recipe? Making it yourself, you’ll know exactly what is going into the sauce. There won’t be any interesting ingredients with hard to pronounce names. Also, you can choose how mild or intense the flavors are. Like a lot of mint, add an extra half teaspoon. Not that crazy about garlic, use only one clove. When you make this sauce, you get to control exactly what it’s taste will be. Of course, if you’re going to make the tzatziki, you probably should make the lamb meatballs to go with it. Shred cucumber and place on several layers of paper towels. Squeeze to remove any excess liquid. Combine cucumber, yogurt, garlic, and mint in a small bowl, and stir well. 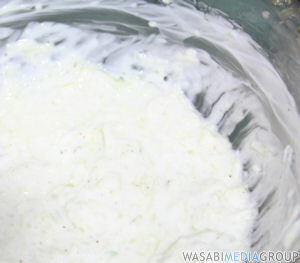 *Tzatziki also makes a great replacement for mayonnaise on sandwiches or as a dip for veggies.